Camo overload, boots, cutes (7qt) | House Unseen. Life Unscripted. You know, the thing about doing all your own blog "workin'" is that sometimes all your social sharing buttons disappear from your right sidebar and are replaced by a 404 error message and you have no idea what happened nor how to fix it. Viva 2 a.m. watching youtube tutorials! What you really want isn't information on the inner workings of blog land, is it? No. You're here for the bebe. Looking at this is like seeing 16 years into the future. "Can't...mow....lawn...comotose..."
I needed a photo of this get-up as proof. Meanwhile, attacking the lilac bush, "Katarina Baderina"
Let's talk about boots. It done turned not hot really, really fast the other day and it was only then that I remembered that I'd tossed my precious Kohl's boots which had been worn daily for the past two winters. I can't find the exact pair on their site right now, but they were a little like this. What to do, what to do. I could replace with another "affordable" pair of faux leather from Kohl's, but now that I know how much I'll wear them, and that I will never ever ever want to be without a pair on hand, I thought it was time for an upgrade. But you know what the problem is with an upgrade? Ding, ding, ding! Dinero. Moolah. Spending of the extra monies. Which is why, of course, I love Ebay so much. 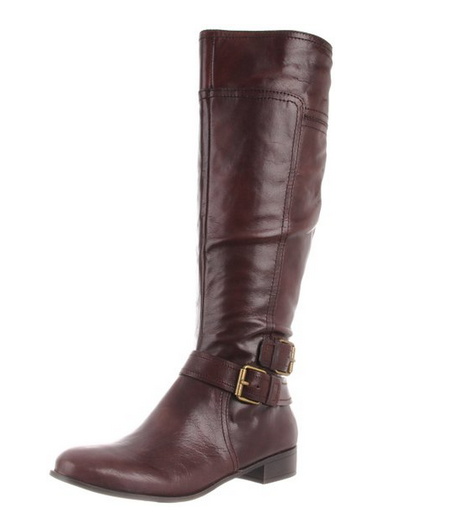 After scouring the internet (my most favorite hobby), I found a pair of Nine West Shiza boots in my size, unused, but super cheap because they were the display pair and didn't come with their original box. Upgraded boots sans upgraded price tag. You know das how I like to roll. But will they become as beloved to me as my plastic Kohl's boots were? Only time will tell. BUT they did arrive today and they are luscious. Better than I imagined and prettier in person than in photos. Oh! The house! Well, things are moving along but we're still not there yet. I'm feeling more hopeful that it will one day be ours, but definitely not hopeful enough to do anything super duper ridiculous like, say, spend several evenings using the Lowe's 3D room designer tool to completely create our new kitchen from scratch. For example. Those boots. To die for. Whoa. Them boots!? I hear about finding deals like that & am impressed!!! Those boots are fabulous, and I'm in love with the pic of Charlie passed out on the pillow. So perfect. Also, your kids are too cute for words, seriously! I'm finally retiring my three year old Target boots and am on the prowl for some new ones. Yours are beautiful!!! He's so adorable and funny, passed out like that! And those boots! Mama like. I live in Texas, where it never drops below 9,582 degrees, and well...I'd like a pair of those boots. The pressing moving question on my mind: does the swingset come with you if/when you go?!?!!?!!! Just came across your blog from a Facebook homeschooling group. Love it!! Love those boots, I need to replace my faux-leather much-loved boots I bought two years ago too. I might need to hit up ebay for some deals! I wore my boots almost every day last winter! I may need to get a pair of skinny jeans (ugh) to fit a slimmer boot though. Do you do the skinny jean thing with your boots? I got my last pair slouchy so that I could fold my boot-cut jeans into them but I love the sleeker boot look too. I do love the skinny jeans with the boots. If you don't want them too skinny, maybe go up a size in the pants? That way you can still fit them in the boots without feeling self-conscious. That being said, I didn't find the hip/waist portion of my skinnies fit me any differently than my boot cut jeans did. The style difference was all from the knee down. Maybe that gives you some hope! Looooove those boots!! In my fantasies I look as fabulous as you do in tall boots. In reality, I'm 5'1 and although I'm petite, I have massive calves from running, swimming, riding, etc. So not only do most tall boots make me look short, they barely fit over my legs. So, ankle boots.